Military families PCSing in the continental US and overseas have an instant community of support and motivation with Stroller Warriors chapters worldwide. Stroller Warriors’s Global Public Relations Representative, Shannon Foote, speaks to Merritt Hamilton Allen and Gary Potterfield during a podcast episode of The Brand Ambassadors. Shannon explains how Stroller Warriors uses social media to grow the Stroller Warriors’ brand. You can read more about the podcast in the Vox Voices blog. Stroller Warriors Running Club and founder Stephanie Geraghty were presented with the 2013 Courage in Sports USAA Athletic Inspiration Award. 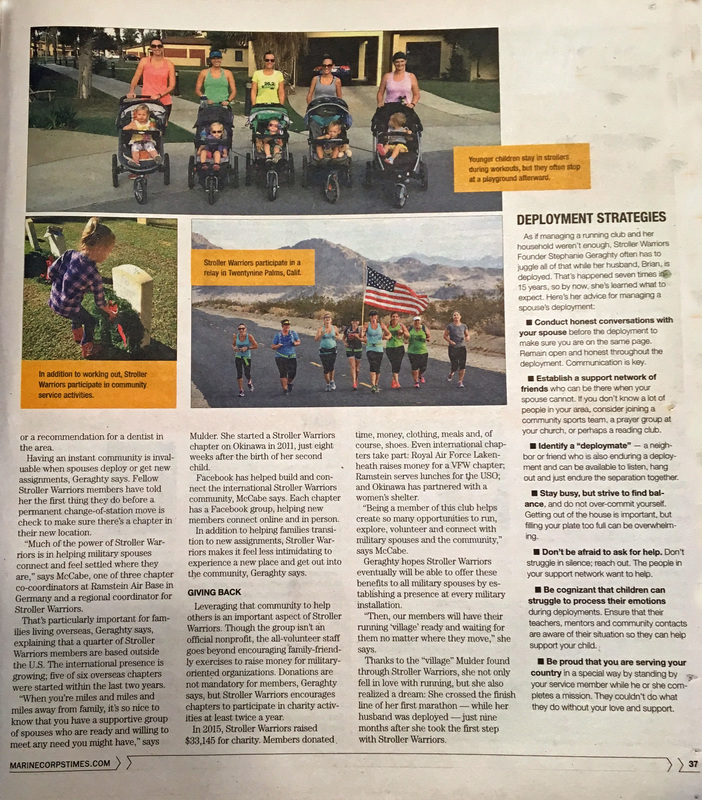 Runner's World featured Stroller Warriors Running Club in their Jan/Feb 2015 issue. Stephanie Geraghty describes the Stroller Warriors' mission in her 2012 Military Spouse of the Year Finalist videos. For the 8th year in a row, Stroller Warriors® Camp Lejeune is excited to bring another large team of Warriors together for the Run for the Warriors race in Jacksonville, NC on May 19, 2018. The charity work that Hope for the Warriors does to help service members and their families hits closed to home and touches the hearts of our Stroller Warriors members in North Carolina. Stroller Warriors® Fort Hood has enjoyed immense success since their launch in March of 2018. You can learn more about the SW Fort Hood chapter in the Fort Hood Herald article published on May 3, 2018. Stroller Warriors Quantico collected new and gently used shoes over a four week period. The shoes were donated to the Jenkins Doneslon Foundation. The Currents™ newspaper featured a photo of the Stroller Warriors® New Orleans chapter participating in the base Mardi Gras parade. A Stroller Warriors Okinawa member describes her journey with the club. From a worried beginning to a fantastic present day, you will enjoy learning more about the positive impact SW Okinawa has on island life in Japan. 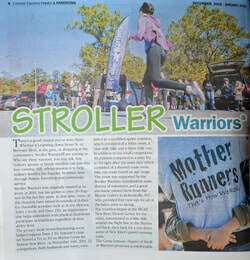 The Stroller Warriors New Orleans chapter was featured in their base paper, The Currents. Stroller Warriors Camp Lejeune led off the Hope for the Warriors video of their 11th annual Run of the Warriors race in Jacksonville, NC. 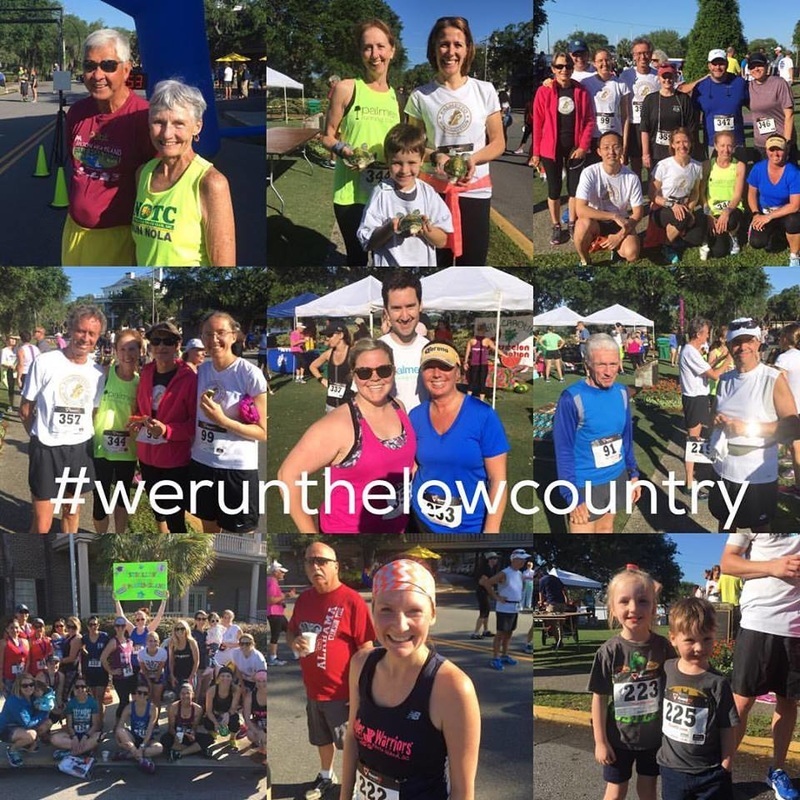 The Palmetto Running Company gave a shout out to Stroller Warriors Parris Island on their Facebook page following the Taste of Beaufort 5K and included several Stroller Warriors photos in their collage. 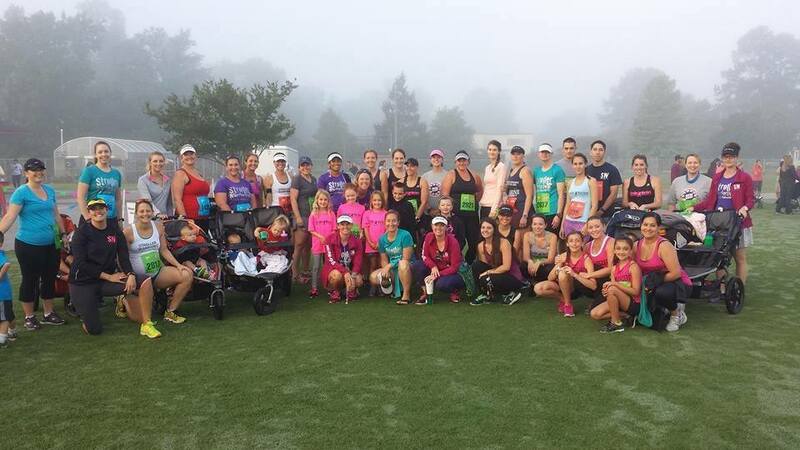 The Stroller Warriors of Monterey are enjoying their local area and forming friendships through running. 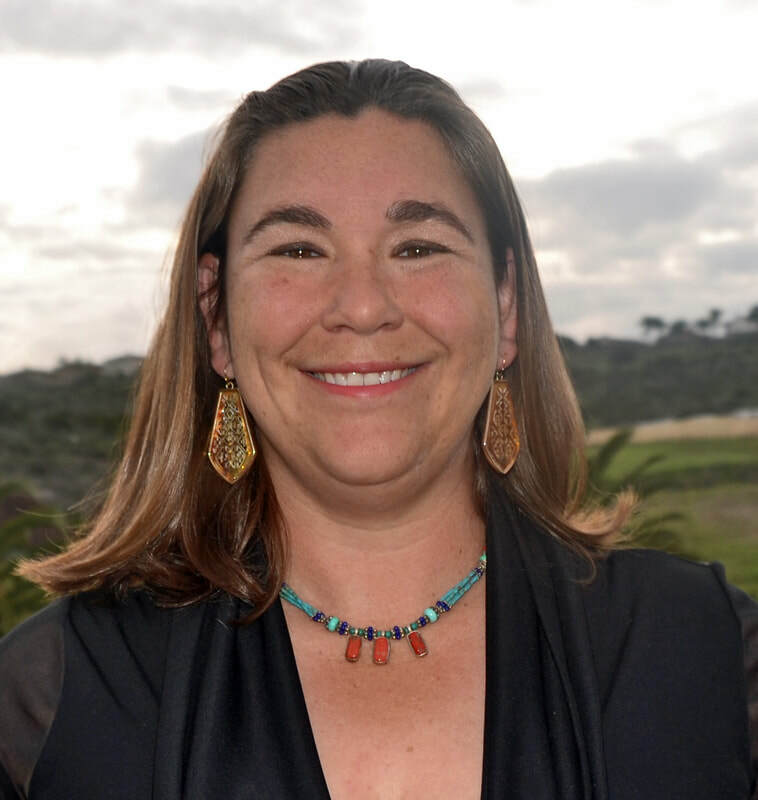 The group has helped several of their members train for the Big Sur International Marathon. Several of our Camp Lejeune based Stroller Warriors were featured in the new AMCC commercial. 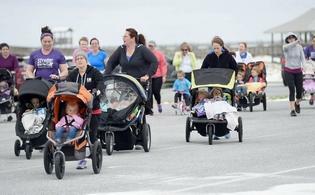 Heavy winds and beach views do not stop the Stroller Warriors of Hurlburt Field from pushing 100 pounds of awesome during their workouts! Stroller Warriors Camp Lejeune members describe how Stroller Warriors has helped them transition during a PCS. With chapters located all over the world forming an instant bond with fellow members in new locations helps to ease the hardships of a move. 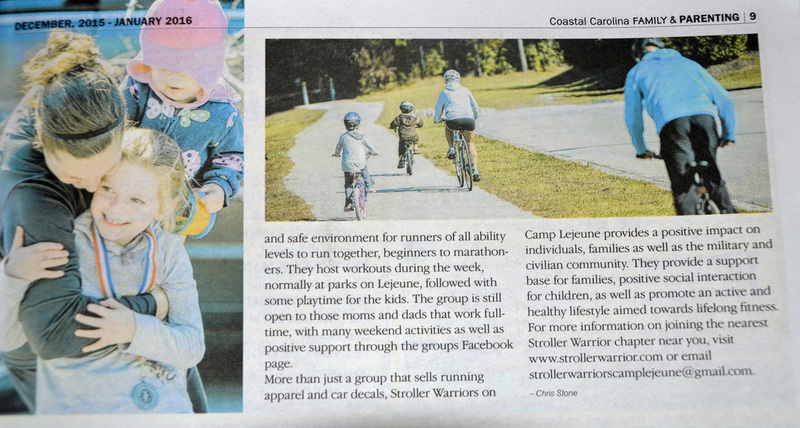 The Coastal Carolina Family & Parenting Magazine featured a story on Stroller Warriors Camp Lejeune's Try to Tri event. 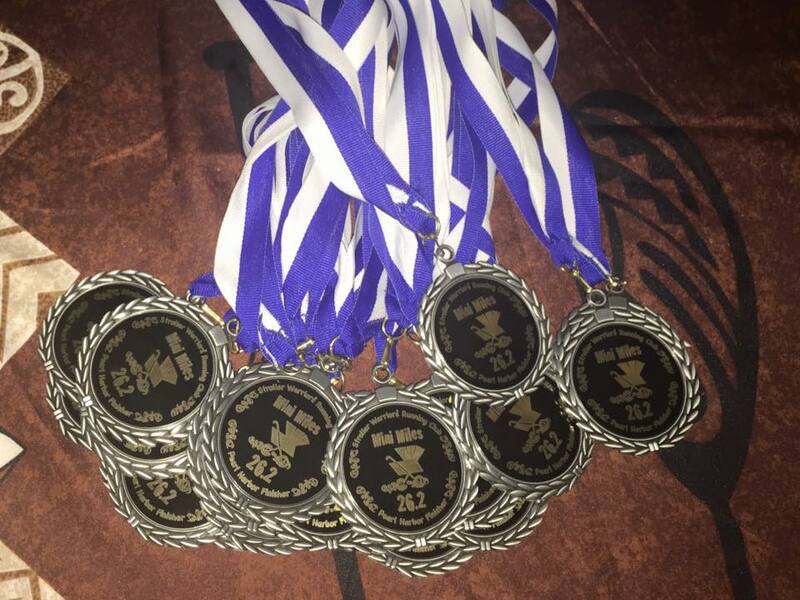 On November 14, 2015 twenty two athletes completed a Sprint Triathlon while 10 children completed a Mini-Tri. 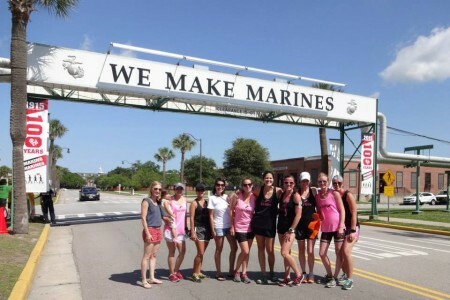 The Stroller Warriors of Parris Island are striving to make a difference in their community. This very active chapter provides opportunities to train together, socialize together, and serve together with local and national charities. 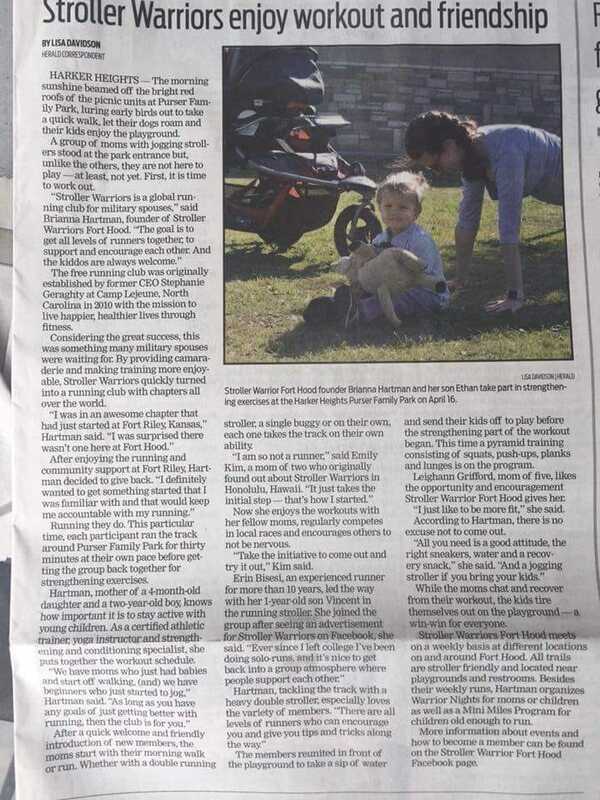 You can read more about these generous Stroller Warriors in the Eat Sleep Play Beaufort post published in June 2015. The Mini-Warriors of Stroller Warriors Pearl Harbor celebrated the culmination of their Mini-Miles program with a triumphant lap around Quick Field; complete with a finish line ribbon break and medal for each participant. You can read more about these motivated Mini-Warriors in the Ho'okele News article published on April, 17, 2015. 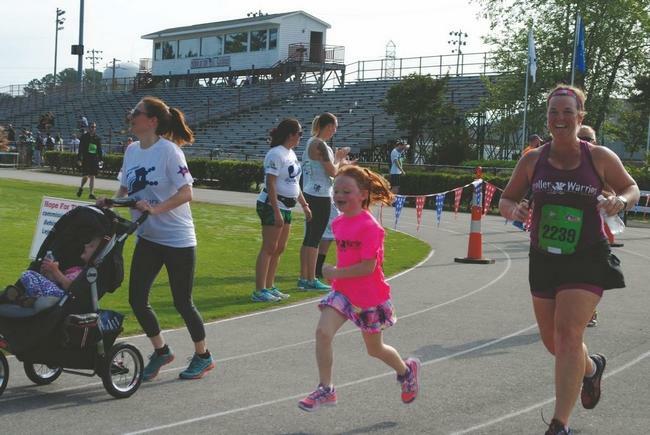 Stroller Warriors Fort Belvoir places an emphasis on providing camaraderie and a welcoming community for its members while supporting the goals of all runners; whether they are first-time runners, runners getting back into the sport, or regular runners. 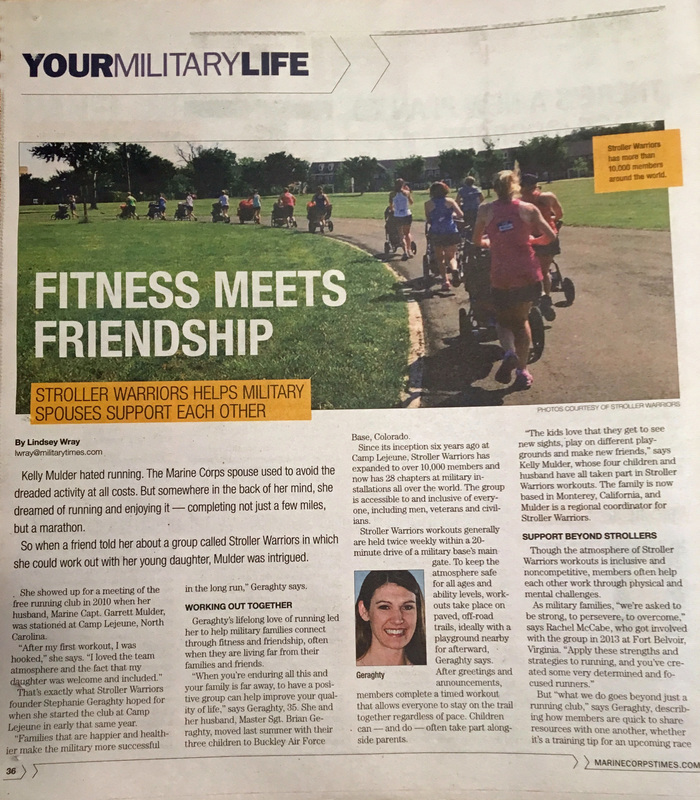 You can read more about these supportive and welcoming Stroller Warriors in the military.com article published on January 20, 2015. 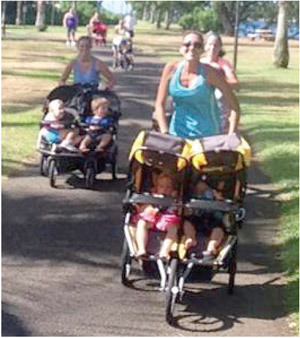 Stroller Warriors Pearl Harbor makes their members feel at home by providing a supportive community for running and camaraderie. 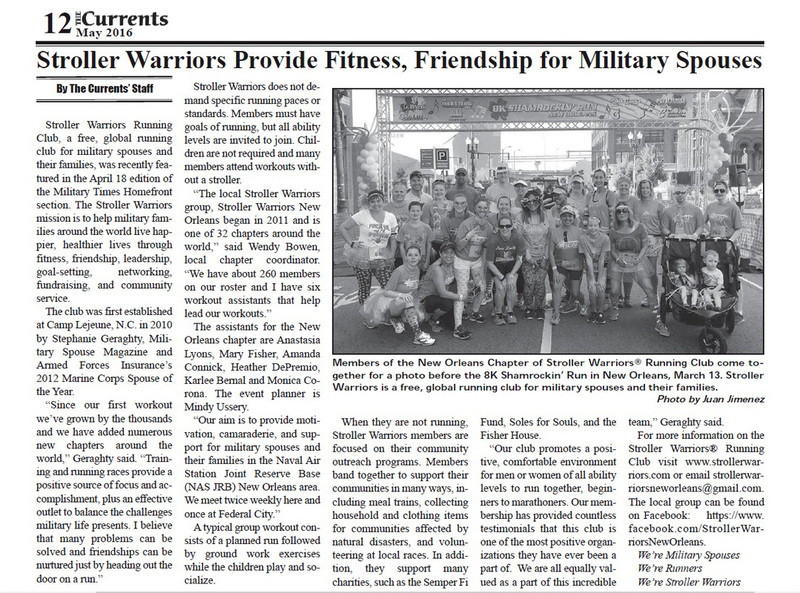 You can read more about SW Pearl Harbor's love of running and community in the Ho'okele News article published on January 23, 2015. 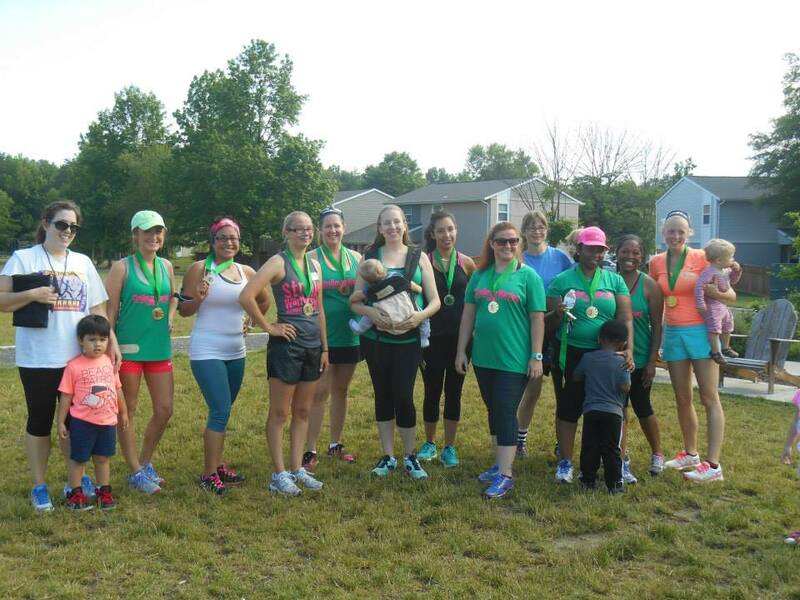 Stroller Warriors Pearl Harbor offers a Couch to 5K program as part of their Couch to Crazy series. You can read more about SW Pearl Harbor's highlights in the Ho'okele News article published on January 16, 2015.